Learning a few tips can help prevent bed bugs from ruining your holiday travel plans. Across the country bed bugs are causing anxiety for folks whose holiday plans include traveling or for those expecting their college student or other traveling family members to visit for the holidays. In this two part series we’ll discuss what you can do to minimize your risk for being affected by bed bugs. 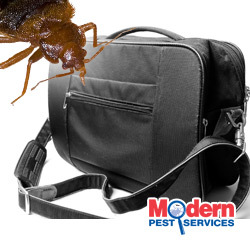 Considering canceling your travel plans because of bed bugs?Worries about picking up bed bugs have been fueled by recent reports of bed bugs showing up in all the likely and unlikely places including hotels and other tourist attractions. In fact in NYC bed bugs in the Empire State Building, Lincoln Center and even Bloomingdales are scaring tourists into canceling their Big Apple vacations. At Modern we realize that there is cause for concern but caution against canceling your holiday traveling plans this year. Instead take along these helpful tips to avoid bed bugs while traveling. If you find yourself in a situation where bed bugs are present in your hotel room, contact the manager immediately and request a new room. Make sure the new accommodations are not adjacent to the infested room as these mobile bugs can travel between walls. Don’t let bed bugs ruin your holiday spirit or change your much-anticipated family getaway. Keep an open eye, remember the tips mentioned above and know that Modern Pest Services is ready to help you with our effective bed bug heat treatments.